SphereChess is a frightening new Monster. It has no officially recorded moves or strategy. No Coaches. No Grandmasters. There is no Software or Computer that can challenge or help a human. There is no Opening Book for SphereChess. The World knows nothing about this insane leap into Infinity. Yet. 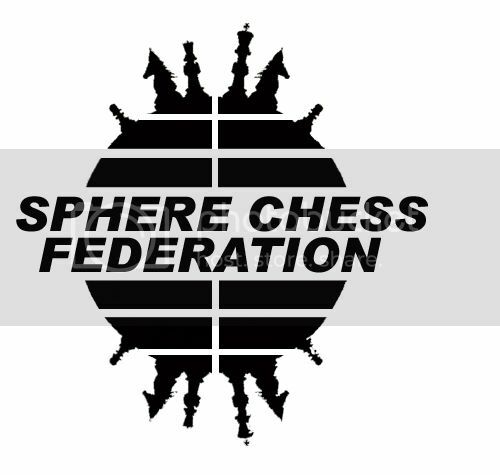 SphereChess has the same 64 Squares and Pieces set up like Chess, but SphereChess Files A-H are arranged concentrically around opposing poles of a sphere. SphereChess Ranks 1-8 extend between these poles. Chess has Backlines and Sidelines. SphereChess has no Backlines or Sidelines. A Chess Bishop from its opening position can hit 7 squares moving forward, either left or right. 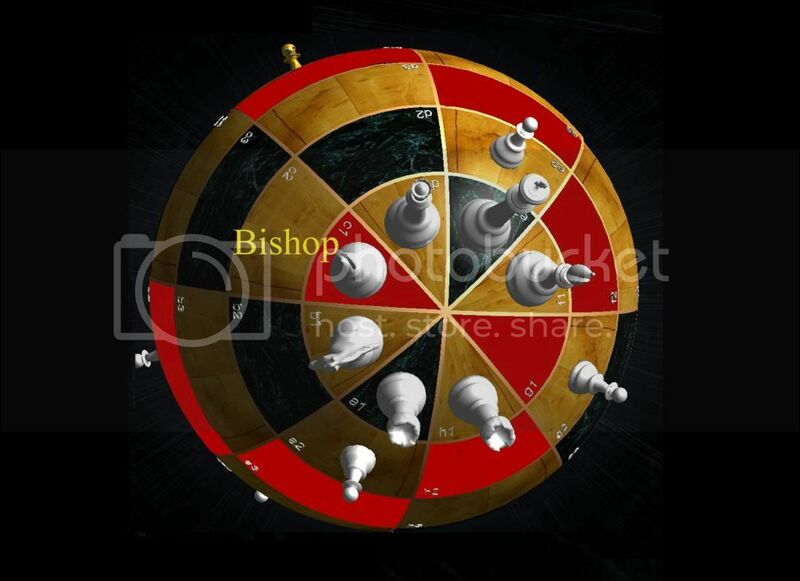 A SphereChess Bishop from its opening position can hit 17 Squares. Not only that, all of those squares can be hit from 2 different directions i.e. forward or backward. 2 of those squares, g5 and c5 can be hit from 8 different directions as this opening Bishop’s diagonal paths of attack around a sphere intersects those squares. 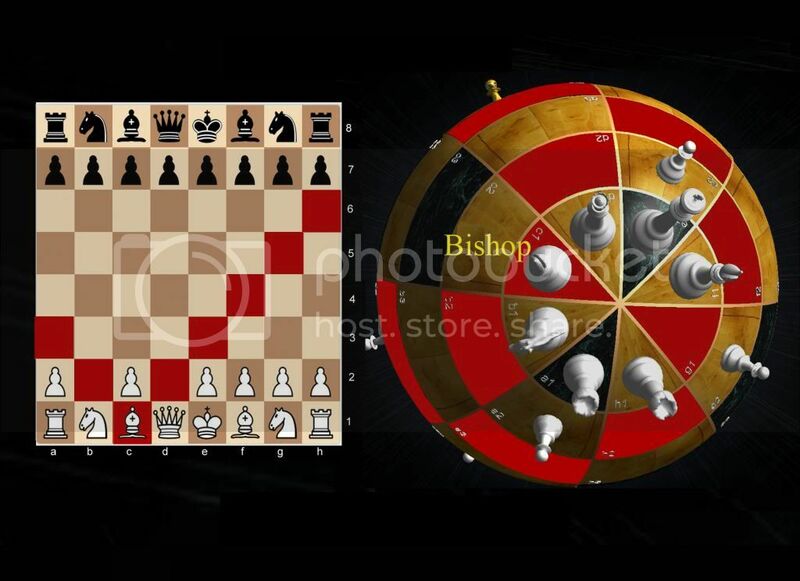 A SphereChess Bishop opens diagonally forward either left or right. 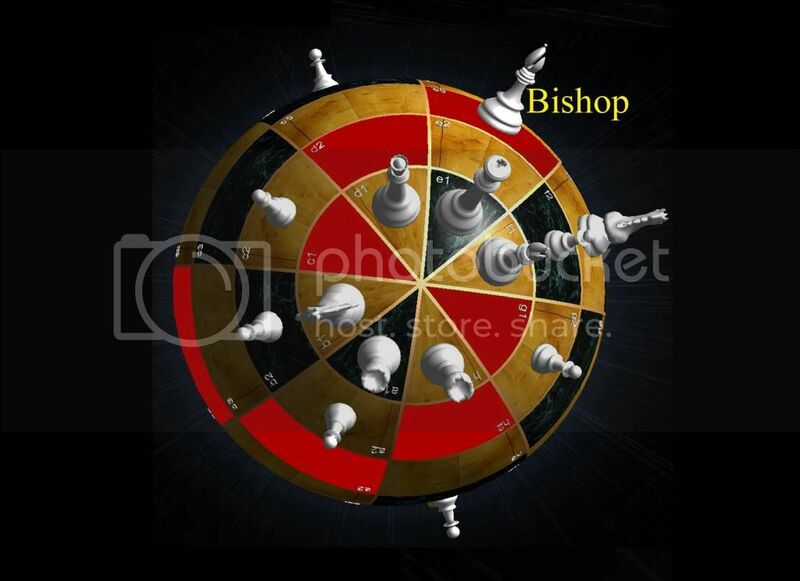 From a pole position, a SphereChess Bishop can also open backward through the pole, either left or right. 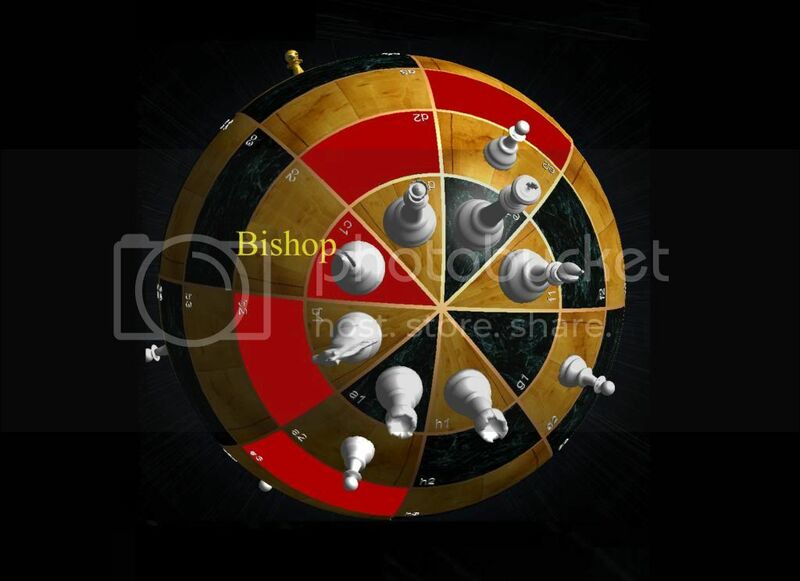 With no backlines or sidelines to stop it, a SphereChess Bishop’s diagonal path of attack around a sphere is diabolical. Moving in one strike it can slice through both poles, forward or backward, thus able to always potentially hit a piece from two different directions, in a stunning “S” shaped infinity spiral. 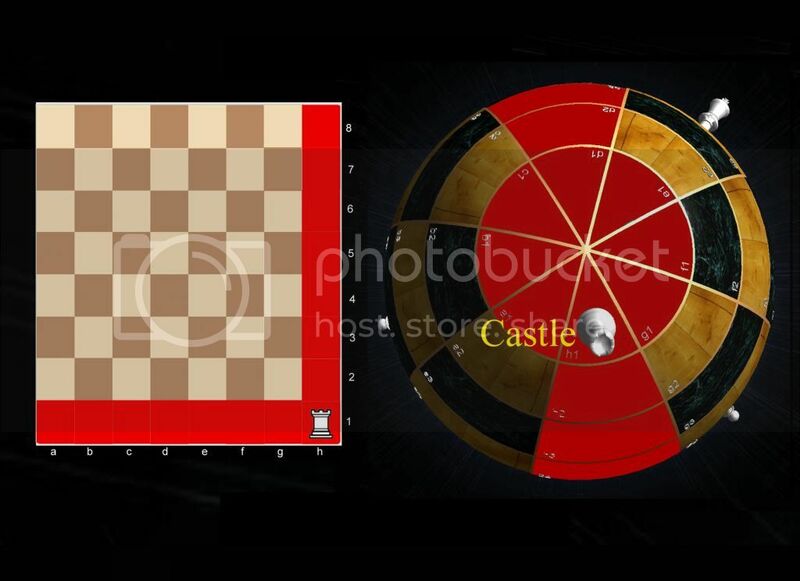 A Chess Castle can hit 14 squares from its opening position. A SphereChess Castle can hit 21 squares from opening, and all of these squares can be hit from 2 different directions i.e. forward or backward or left or right. 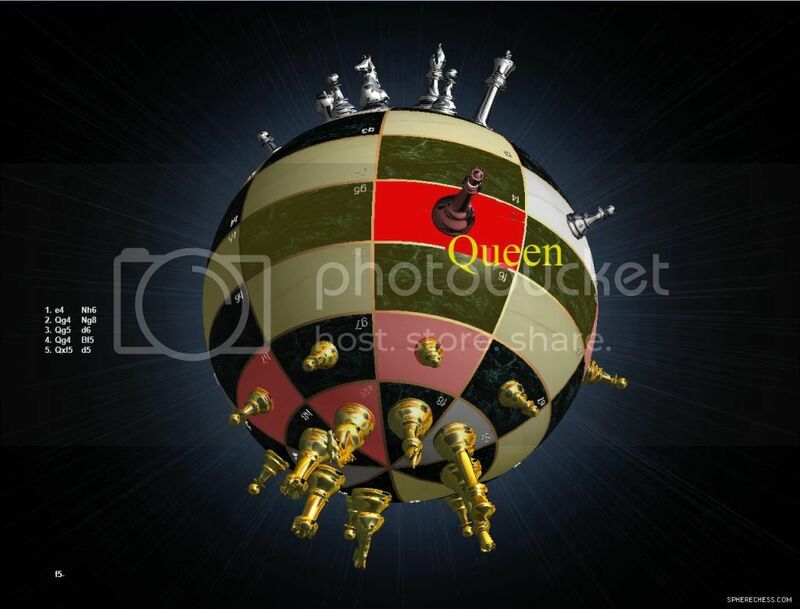 With no backlines to stop it, a SphereChess Castle can move forward or backward through its own or the opposite pole. 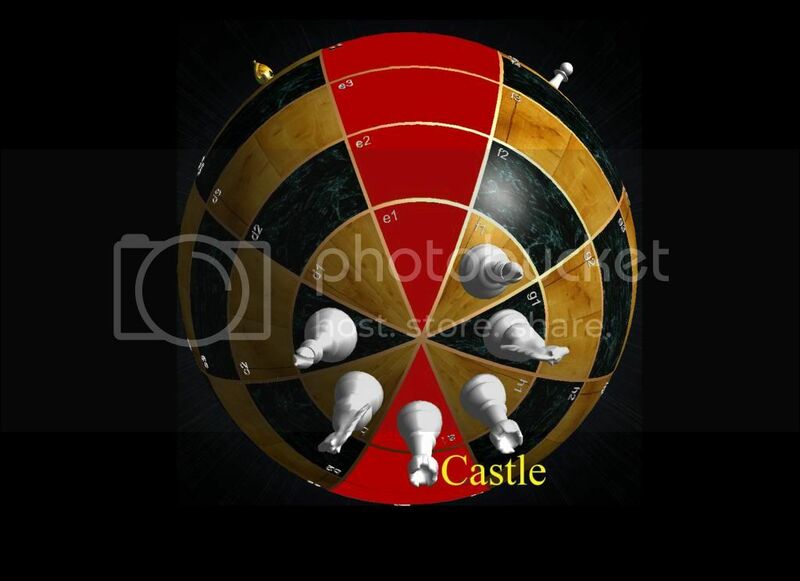 With no sidelines to stop it a SphereChess Castle moves completely around the poles, left or right. 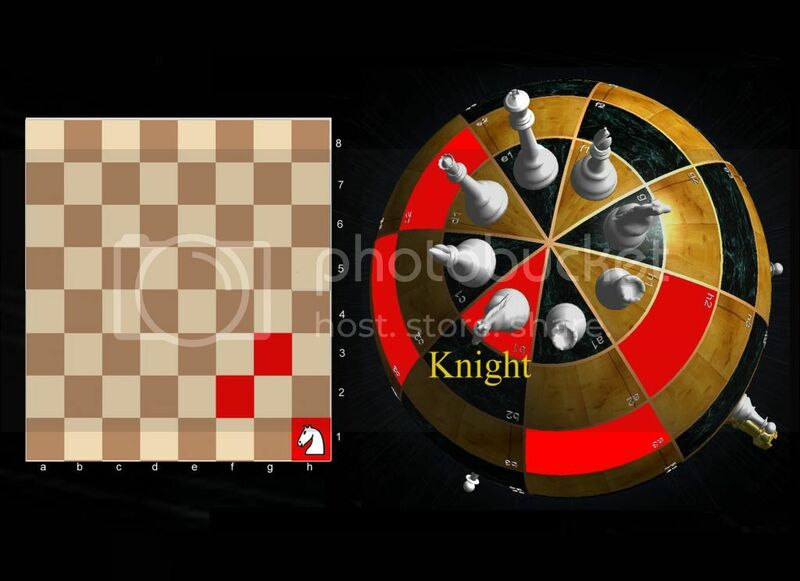 Because of its “L” shaped movement a Chess Knight positioned at the edge or even close to the edge of a square board, or worse a Chess Knight trapped in a corner can only hit 2 squares i.e. the term “Dead Horse”. Moving its traditional 1 or 2 squares forward or backward and 2 or 1 squares left or right, with no backlines or sidelines a SphereChess Knight has no corner to be trapped in and can always hit at least 4 squares. 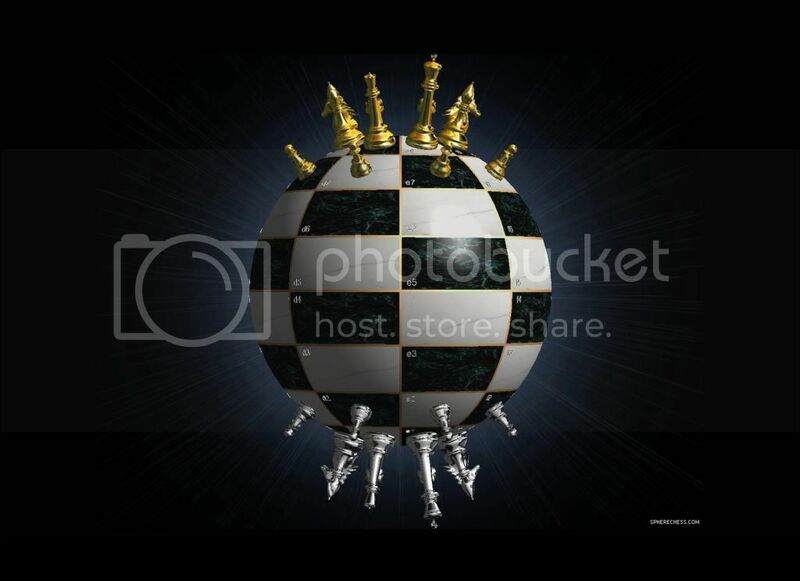 A SphereChess Knight cannot be trapped anywhere on a sphere and remains a force to be reckoned with at all times. NOTE: The Knight does not move directly through a pole, but around the poles, to maintain the integrity of its traditional “L” shaped movement. 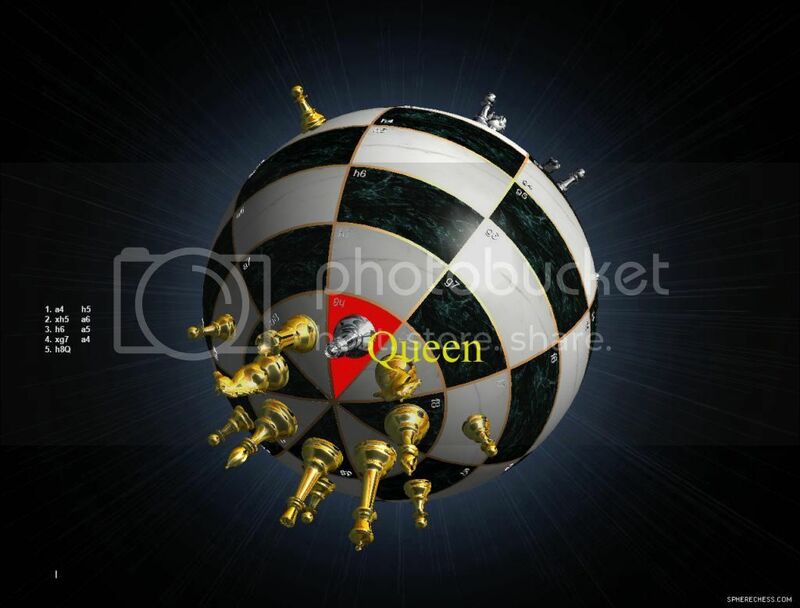 There’s nothing more terrifying than a SphereChess Queen. She can move as a SphereChess Bishop or SphereChessCastle. From whatever square she stands on, with no backlines or sidelines to stop her a SphereChess Queen has mind boggling power. A SphereChess King moves one square at a time. The King is denied any power. To preserve the integrity of its vulnerability and its entrapment, a SphereChess King cannot cross a pole or move from file A-H or H-A. 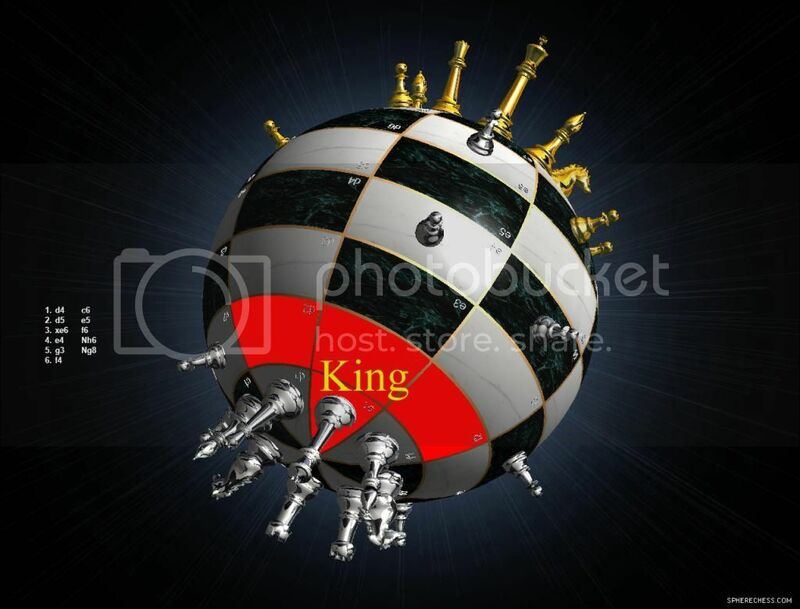 A SphereChess Pawn opens 1 or 2 squares forward and thereafter moves 1 square forward at a time. It captures 1 square diagonally. 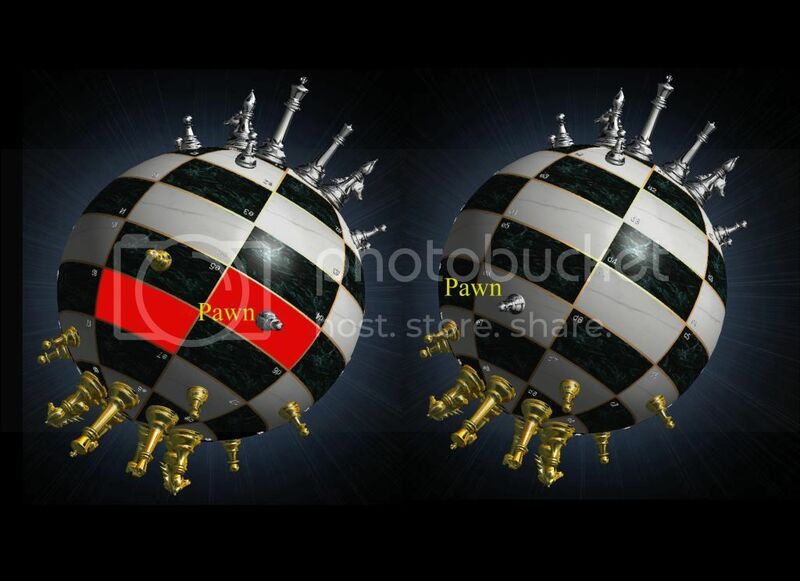 This SphereChess Pawn can capture either the Castle or Bishop 1 square diagonally. 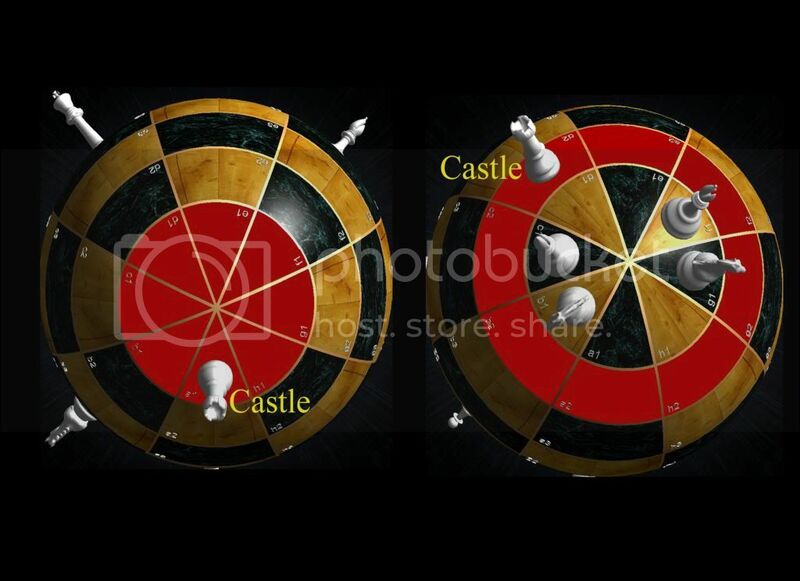 By capturing the Castle the Pawn has reached the enemy pole and may Promote to either a Knight, Castle, Bishop or Queen. 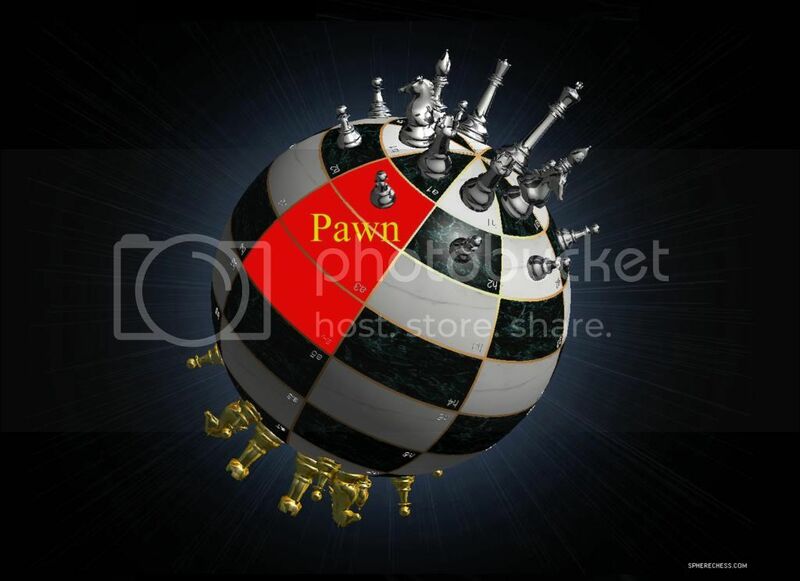 A SphereChess Pawn opening 2 squares forward can be captured by an enemy pawn had it only opened 1 square forward. 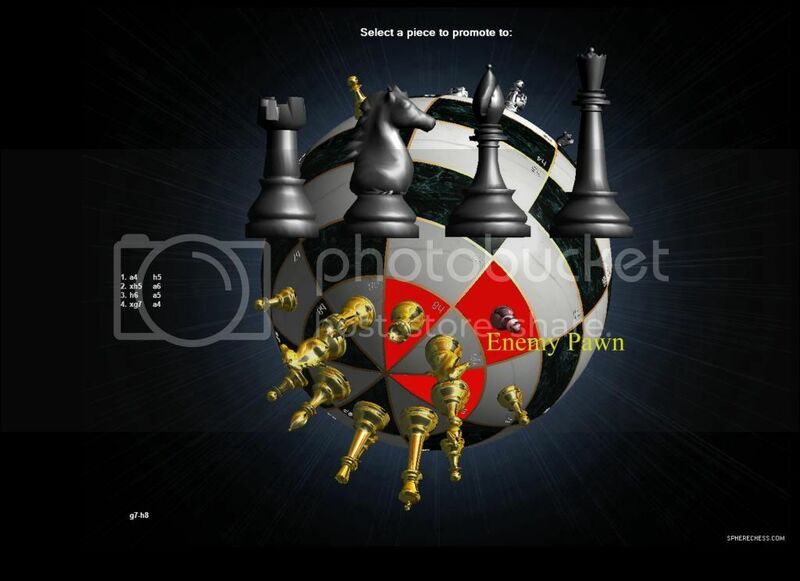 This is a special capture allowed only on the very next turn or it is forfeited, by an enemy Pawn that is able to move to the square the captured Pawn would have stood had it only moved 1 square foreward. 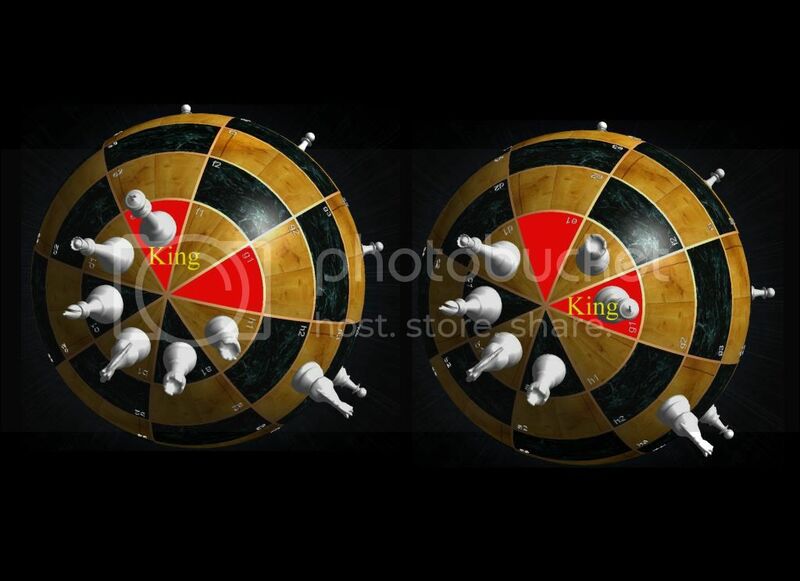 The King moves two squares towards a Castle around the pole, then the Castle moves onto the square over which the King crossed. 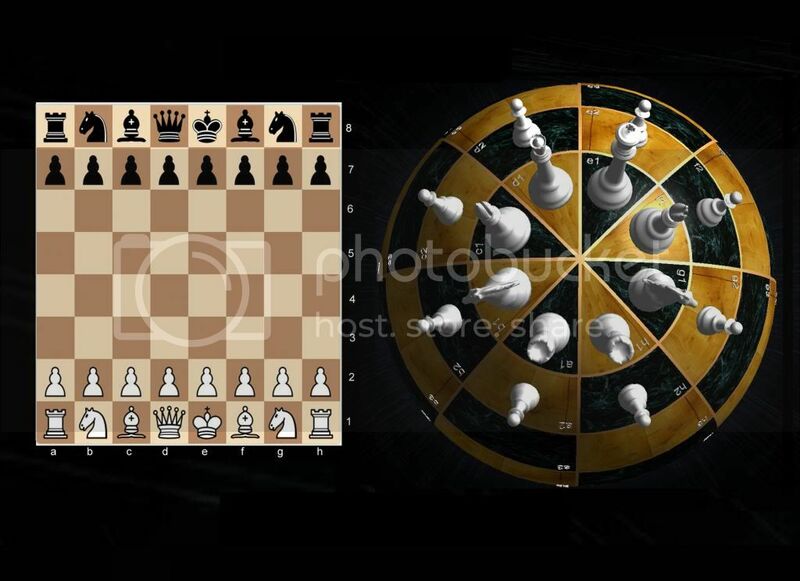 Castling can only be done if the King has never moved, the Castle involved has never moved, the squares between the King and the Castle involved are not occupied, the King is not in check, and the King does not cross over or end on a square in which it would be in check. Important Quick Update Messages Will Be Announced Here!